Almost every online casino is trying to attract as many customers as possible by offering lucrative bonus offers and promotions. However, what not that many players pay attention to are the wagering requirements which are usually stated bellow each offer. The wagering requirements, also known as playthrough requirements, are numbers that tell players how many times they have to playthrough either the deposit + bonus amount or only the bonus amount before they are eligible to request a withdrawal. 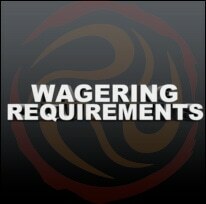 Many players wonder why wagering requirements exist and why online casinos have them at all. The reason, however, is very simple. Playthrough requirements are kind of a protection to online casinos that had to find a way to prevent customers to simply cashout the bonus and leave. Without wagering requirements, bonuses would be the same as free cash which is given away to those who register an account. Why Do They Differ for Each Casino? The wagering requirements at one casino can be completely different from the wagering requirements at other casino. One of the ways to explain this is to say that wagering requirements have become just another way of attracting new users and hence casinos try to make them attractive and better than the ones found at rival sites. Let’s imagine a welcome bonus offer of 100% up to $100 whose wagering requirements are 30x the bonus amount. You decide to make a deposit of $100 and claim additional $100 as bonus money which you would like to withdraw. This means that you have to playthrough the bonus money amount of $100 for 30 times. This time you claim a 100% match bonus of $200 whose wagering requirements are 20 times the deposit + the bonus amount. This means that you have to playthrough $200 deposit + $200 bonus 20 times. Once players have claimed a bonus and they want to meet the wagering requirements they have to know that different games have different contribution towards meeting those requirements. Therefore, some games such as slots have a 100% wagering contribution, whereas others contribute only 10% or 5%. This means that if players place a $10 bet on slots, that whole amount is calculated towards the wagering. However, if players place a $10 bet on blackjack, which has only 10% contribution, it will be calculated as $1.